Why settle for a stock piece of furniture when you can have a custom home entertainment center designed specifically for your space and storage needs. Choose from an endless array of colors, finishes and accessories for your custom entertainment piece that corresponds with your homes feel and decor. 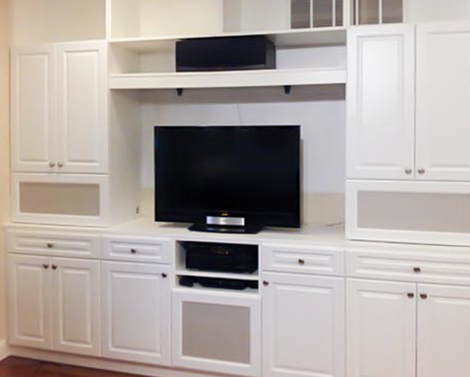 Beyond Storage carries a variety of custom cabinets and adjustable shelves to perfectly fit your TV, electronics and movies. Knowing every family is unique, our designers will help you establish what areas of storage you are looking for. No entertainment area is too big or too small for our expert designers to work with.